floors and appliances with drop cloths to prevent scratches, dirt and dust buildup. Doors, drawer fronts, molding, and other attachments are removed from existing cabinets. Add additional cabinets, repair any cabinets needing structural repair such as replacing cabinet floors under sink. All cabinet exterior surfaces with luan including cabinet bottoms. 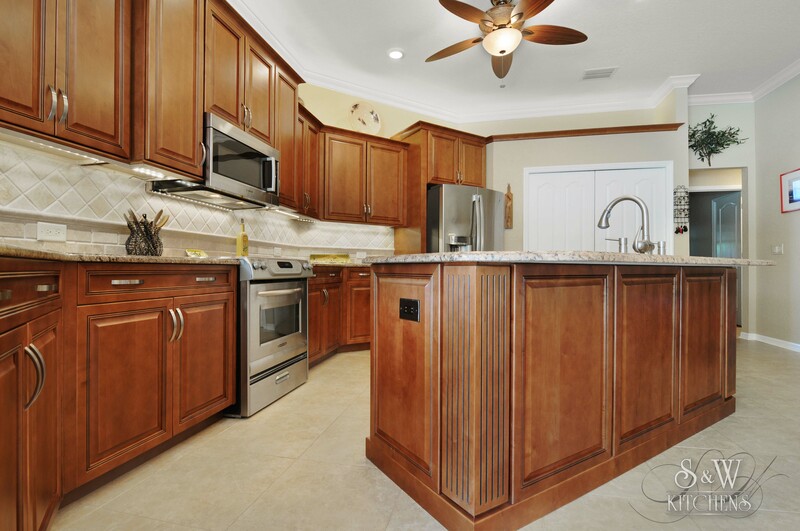 All cabinet exterior surfaces with new solid wood prefinished veneer or laminate, permanently bonding veneers to cabinet exteriors, the grain pattern duplicates the look of custom cabinets. New matching solid wood doors and drawer fronts, new matching trim molding, custom handles and hinges. New drawer boxes and glide systems. New matching toekicks at base of cabinets. Everyday and at the end of the job, hauling away all job related debris including old doors and drawer fronts. Walk the entire job with you to ensure that all of our quality standards are met and that you are completely satisfied with the project.